Eloise Ross joins us to talk the films of Robert Wise! For our first show of 2018, we welcome writer and critic Dr Eloise Ross, who joins us as we check out some of the key films from this month, including Steven Spielberg’s paean to press freedoms The Post (01:04), Guillermo Del Toro’s dark romantic fantasy The Shape of Water (05:46), Don Hertzfeldt’s animated science fiction sequel World of Tomorrow Episode 2: The Burden of Other People’s Thoughts (10:23), and Ridley Scott’s Getty dynasty biopic All the Money in the World (13:16). This entry was posted in podcasts and tagged a game of death, a storm in summer, all the money in the world, audrey rose, blood on the moon, born to kill, criminal court, destination gobi, disney, eloise ross, executive suite, fox, helen of troy, i want to live!, mademoiselle fifi, mystery in mexico, odds against tomorrow, robert wise, rooftops, run silent run deep, so big, somebody up there likes me, something for the birds, star trek: the motion picture, star!, the andromeda strain, the body snatcher, the captive city, the curse of the cat people, the day the earth stood still, the desert rats, the haunting, the hindenburg, the house on telegraph hill, the post, the sand pebbles, the set-up, the shape of water, the sound of music, this could be the night, three secrets, tribute to a bad man, two flags west, two for the seesaw, two people, until they sail, west side story, world of tomorrow episode 2: the burden of other people's thoughts on January 31, 2018 by The Hyphenates. 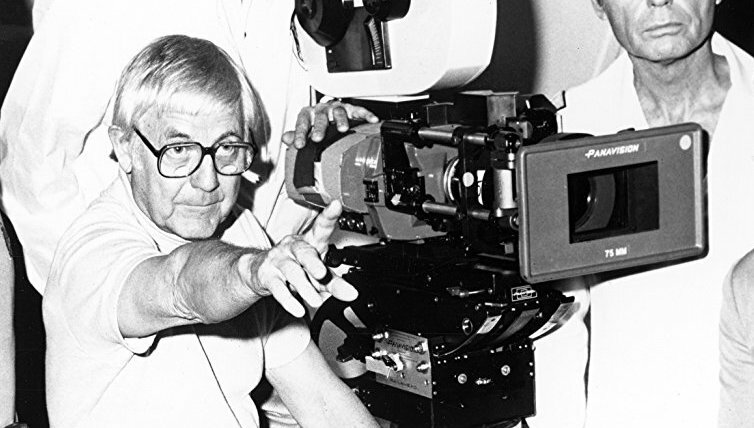 There wasn’t any type of film Robert Wise couldn’t make. His first six films included two horrors, a period drama, a thriller, a courtroom drama, and a crime noir. He was a polymath long before he’d even dipped his toe into science fiction or musicals, and he conquered those genres as comprehensively as he did the others. Your evening kicks off with The Day the Earth Stood Still, an enduring classic and easily one of the most influential science fiction films of all time. It’s pulp with heart, a fascinating angle on the alien invasion trope that turns the spotlight on humanity with such brutality, it feels like it was made for audiences from Klaatu’s home planet. There’s no better cautionary tale about the morality of human beings, and we guarantee you’ll be pretty wary of them after seeing this film. Once that’s done, switch gears and pop on West Side Story. This film feels like the musical genre’s missing link, bridging the gap between the classic MGM musicals of the Freed Unit, and the more modern, less sanitised genre it eventually became. As an update of Romeo and Juliet, it’s inspired. As a commentary on the American Dream and systemic racism, it’s years ahead of its time. As a musical, it’s one of the greatest of all time, with music by the legendary Leonard Bernstein and lyrics by an offensively-young Stephen Sondheim. As a film, it is a certified classic, beautifully shot and perfectly choreographed. 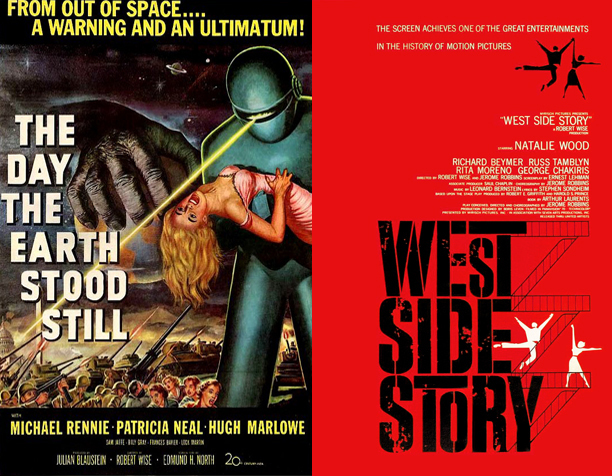 Watch these two films back to back and you’ll be a confirmed Robert Wise fan before the night is over. Substitutions: If you can’t get or have already seen The Day the Earth Stood Still, seek out The Set-Up (1949). This is one of the earliest examples of a film running in real time, beating High Noon to the screen by three years. An aging boxer refuses to throw a fight, despite the threat from gangsters trying to put the fix on. It’s one of the greatest boxing films of all time, and a personal favourite of Martin Scorsese in case our recommendation isn’t enough for you. If you can’t get or have already seen West Side Story, get your hands on The Sound of Music (1965), that other legendary Robert Wise musical about a girl named Maria. This film oscillates between its reputation as cornball sing-song and Nazi-flag-ripping meme, but there’s a reason it endured long after musicals fell out of vogue. If you only know the film from a few melodic snippets and one Austrian helicopter shot, clear an evening and sit down with one of the seminal works of cinema history. The Hidden Gem: Want to see something off the beaten path, a title rarely mentioned when people talk about the films of Robert Wise? Then you should track down Audrey Rose (1977). Anthony Hopkins stars as a man who believes that the daughter of a New York couple is his own daughter reincarnated, and that’s all we’re going to say. It’s tense, dramatic, and constantly surprising; the biggest mystery is how it’s managed to elude classic status for so long. The next episode of Hell Is For Hyphenates, featuring Eloise Ross talking the films of Robert Wise, will be released on 31 January 2018. This entry was posted in blogs and tagged audrey rose, cheat sheet, eloise ross, robert wise, the day the earth stood still, the set-up, the sound of music, west side story on January 21, 2018 by The Hyphenates.